One of the things this election will be notable for is how well the Press is using digital media and interactive pages to dissect the issues and polls. I've gathered a slew of them and posted them in the Digital Media Tab. Official website visits, YouTube, Facebook, Blogs, Polling: This election has had an enormous amount of internet generate content, much of which actually shed some light on the election campaign and issues. The third and final installment of our redesign saga, for those of you who find this stuff remotely interesting. Tonight, we look at final design, the goals behind the changes, and how the content is being re-organized. Clean Design: I wanted to make the site less busy, less colorful, and more content focused. A bit more professional. 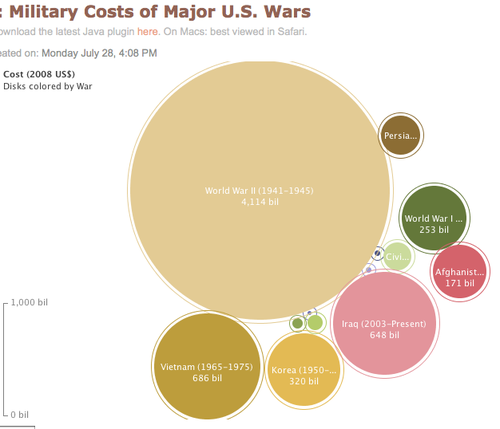 I think we accomplished that, with lots of white space, wider columns for bigger charts, and cleaner fonts. Word Press: That's right, I made the big leap to Word Press. All the geeks insisted it had to be WP. There are all sorts of cool things you can do with plug ins, and we are going to make the site hum. I am open to any and all suggestions as to how to customize the many things WP can do. Guest authors: I know all of these brilliant fund managers, great journalists, unique traders, and clever analysts -- none of whom have an outlet for their less formal work. They cannot be bothered running their own blogs. Hence, the Big Picture Cafe -- an instant platform for these voices. I already have a killer line up of guests, too. Lots of things I am not getting to -- more coverage of the financial media itself, various money management firms, people and personalities. And if this stuff doesn't interest you, well then, don't click that tab. Book and Video Tabs: Some people don't want to bother with the video or book reviews. Well, now they are all in one locations. All of the videos, and all of the book discussions, each get their own area. Its fluid, but I may even set up a book discussion forum via some software (I hear Beast is pretty good). Job Listings: I get quite a few resumes per week, none of which I can use. We went to JobThread to set up a financial/market/economics job board for us. Looking to hire someone? Looking for a job? You've come to the right place. Advertising: I wanted to make the site more advertising friendly -- the main column is 710 wide, perfect for those banner ads. The right column is 300 wide, for the 250 X 300. There is room at the end of each post for an occasional advert. Traffic: I get a pathetic 1.2 page views per visitor (most sites get more). More of the content is going to be structure within the tabs, and less material will appear on the front page. Click people! Get used too it. Monetize this: I haven't done much to let people use the blog to find our commercial services. Rather than beat people over the head with it, I kept it very subtle. You want to know about our Asset management? Click Nav bar button. Interested in our software tool? (click) Media looking for a quote? (click) Need to contact someone? (click) Want to advertise on the blog? (click). The nice thing about actually monetizing the site is that I can plow alot more resources back into it: Hire a dedicated researcher, an intern, a person specifically working on X. And the final design? Its after the jump. Launch is 6 am tomorrow . . .
Continue reading "Big Picture Redesign, part III"
Last week, I mentioned the progress in the site redesign. For those of you who find this sort of thing interesting, tonight I want to walk you through some of the re-design process. Enough of you have emailed about it, so some of you like this art stuff. Any ideas for the header graphic? I have been stymied trying to come up with something for that, but then I am not nearly as creative as you . . . I feel like the header should have to do with the name, The Big Picture. So, is it a movie screen? Is it something obscure like a frame or hands framing? I don’t know, we can think of it more. Because the name says there is a lot more than just financial. You have something for everything on the site. So it should be more vague. How about these . . . ? Continue reading "Big Picture Redesign, part II"
Just got home from the conference with Nouriel Roubini et. al. Mad props to Marketbeat for live blogging the entire session (after the jump). This was a dry run for the next version, which might be 4 people (any names you might like to see/hear? Use comments to suggest others). 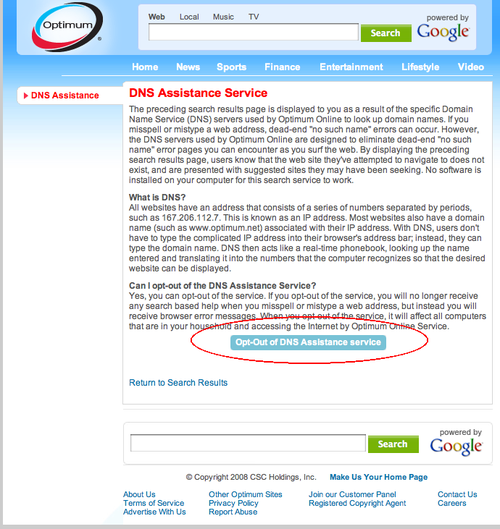 Continue reading "Roubini Ritholtz Conference Call"
Here's the latest insanity from my internet provider, Optimum OnLine by Cable Vision: DNS Redirect. I used to just punch in "WSJ" into Safari's URL, hit enter, and off I went. Any URL worked that way. Since last week, that now sends me to an ad-based Optimum page (powered by Google). On the Windows machine in the office, I use "Control Enter" for the same effect. 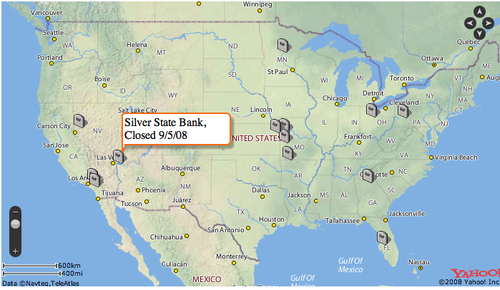 Incensed, I called the help line and found out this was a system-wide change since 9/22/08. The woman also tells me I was the first person to complain, no one else has had a problem with it. Apparently, the folks at Cablevision decided that they wanted to capture some of that sweet, sweet Google ad revenue. So on their own, they involuntarily switched all of their internet subscribers over. Not opt in mind you, but forced over. Any URL entered that does not immediately conform to the usual "HTTP" format sends you to an Optimum Online/Google page. Note that this defeats a nice function that has been on Safari and Firefox for a while. The company line is that this is a form of search assistance -- gee, I guess I don't want to go to the page I go to all the time, I want to first SEARCH for that page. Yes, Cablevision, that is a whole lot more helpful. It shows you what even a a slight bit of monopoly power is so easily abused. 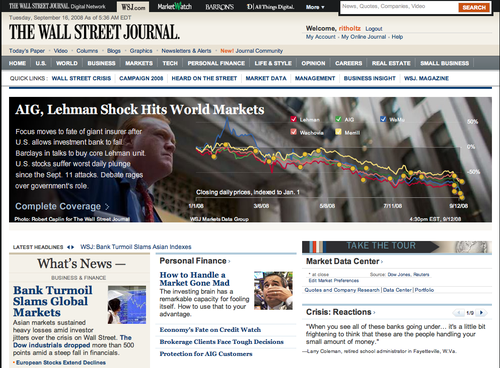 I have yet to really play with the new WSJ.com, but it looks slicker than the old version. The most significant change -- besides the colors and layout -- is the community side of it. You can now post comments on every single WSJ published story. I am not sure how that will ramp up. 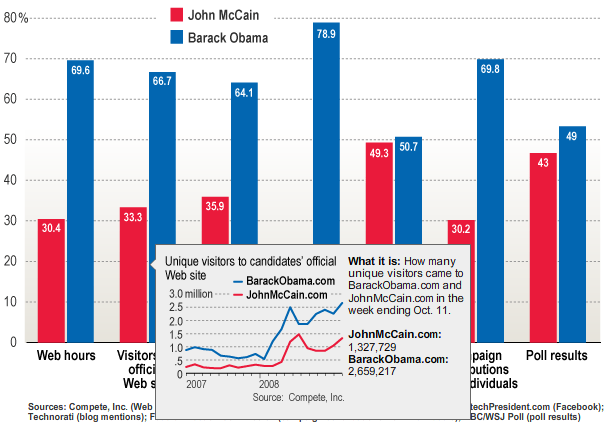 Its going to be somewhat interesting to see how this ramps -- and what the NYT does. Up til now, I gave the Times website the edge in terms of breadth and interaction. 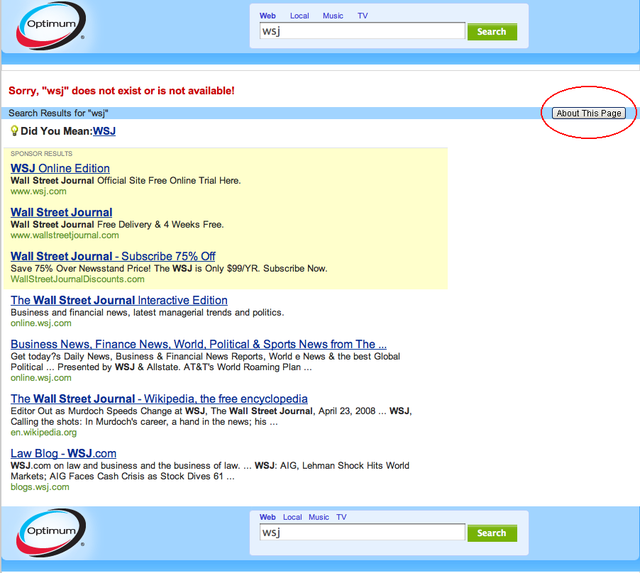 We will see if this brings the WSJ site up to the NYT in terms of depth of content and traffic. Ditching the Apple iPhone . . . I very patiently waited for the iPhone to go 2nd generation, move to a 3G network, and work the kinks out. I got one two weeks ago, and it is likely to get returned some time over the next two weeks. Why? As a toy, it is delightful. It is a wonderful gadget which is endlessly amusing to play with. I very much am going to miss it when it goes back. As a phone, it is all but useless. At least, that is the case in my neighborhoods, which include the North shore of Long Island, and Manhattan. (That any wireless network doesn't have 5 bars throughout all of Manhattan is completely inexcusable). I blamed the AT&T network for much of the problems, but I suspect the phone should also get some portion of the blame too. Apple is releasing a software fix for the 3G call dropping issue Friday. <sigh> Its gorgeous, lovely toy. If only it worked as a phone . . . The candy slab of delicious glass reminds me of a story from my college days. I went to SUSB Stony Brook, and near the campus was an exotic car showroom. The owner was a very kindly older Italian gentleman, who was endlessly patient with me, a poor college student. I fascinated by what looked like a museum showroom filled with very expensive Aston Martins, Jaguars, and Ferraris, and the like. I couldn't even pay for the premium gas to fill any of them up, but he treated my like a potential customer. You could not ask for a classier car salesman. I sometimes stopped by when they weren't busy, and this gentleman driver -- with his delightful accent, thinning gray hair and a huge handlebar mustache -- would educate me on automotive history. I loved the Astons, and he showed me the elegance of the older Ferraris, and the racing dynamics of the newer machines. One day, a white Lamborghini Countach showed up on the showroom floor. It was weird and angular and futuristic and unlike any other car I had ever seen (this was 1983 or so). I asked him about it, and he cringed. He put his finger over his lips, as he tsk-tsked, and slowly shook his head "no." In that charming Italian accent, he said something to me I have never forgotten: "The Lamborghini, she is like a beautiful woman that is very bad in bed." Being a wiseass, my instant response was obvious: "Oh, yeah, I dated her for a while." I have never had the opportunity to retell that story -- until now. The iPhone -- like that Lamborghini -- is gorgeous and exotic and unlike anything else you have ever seen. But as a phone in the NYC area, it just does not work well. As my Italian automotive professor would say, "she is just like that beautiful woman who is very bad in bed." 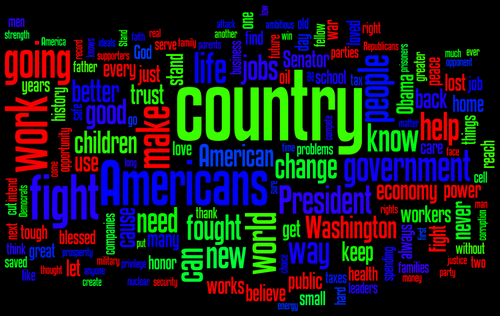 Last week, we looked at Obama's acceptance speech via Wordle. As promised, here is the same treatment for McCain's speech.